Rigging Sleeves – Summit Anchor Co. 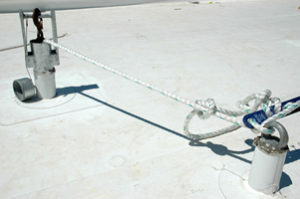 Typical rigging sleeve application for overhangs, showing suspension and lifelines safely rigged on the roof . Rigging sleeves are engineered to allow the maintenance worker to gain access through such building features. They accomplish this by providing a passageway through which the worker can safely feed his rigging suspension lines. After securing his lifeline to an independent anchor, a maintenance worker simply ties his suspension line to the steel rod on the top of the rigging sleeve, removes the rigging sleeve cap, suspends both lines through the rigging sleeve, then returns to a lower level where a platform is located to secure himself and the platform to the suspension and lifelines. Our rigging sleeves are designed with a steel cap and installed in a way to ensure the building remains watertight, despite roof penetrations. Our rigging sleeves are completely hot-dipped galvanized after fabrication to resist corrosion. Our rigging sleeves have been engineered and tested to comply with current OSHA and ANSI I-14.1 safety standards for fall arrest and suspended maintenance. Many installation methods are available to suit reinforced concrete or structural steel structures. In addition to our standard vertical design, curved, horizontal, and recessed rigging sleeves are also available to suit almost any application.